May 2015 n Performance & Hotrod Business n 51 a used Chevrolet chassis with a standard Chevrolet six. In the mid-1930s, the city of Allentown sent the truck to Luverne Fire Apparatus Co. of Luverne, Minnesota, to have a fire truck body made for it. When the Allenton Volunteer Fire Department decided to sell the truck, a handful of firefighters bought and restored it. They did the mechanical work themselves, but took the truck to restorer Ross Obermeyer—the owner of Obermeyer's Highway 41 Auto Body—for body work and paint. Obermeyer, who works on everything from capital-C Classics to muscle cars, applied new paint on the truck. 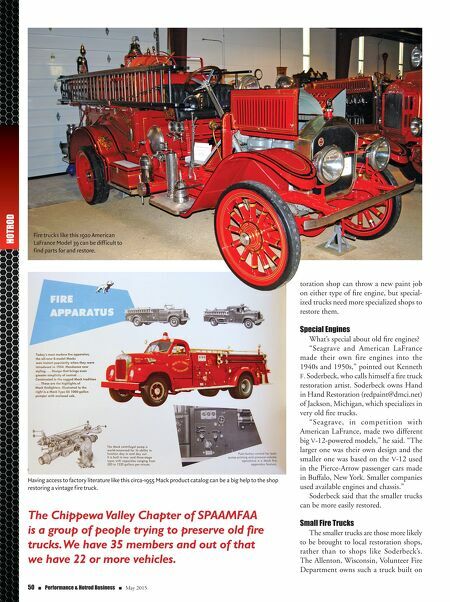 Okie Allen, assistant chief of Township Fire Department in Eau Claire, Wisconsin, is active in the Chippewa Valley Chapter of SPAAMFAA. "We're a group of people trying to preserve old fire trucks," Allen told Performance & Hotrod Business. "We have 35 members and out of that we have 22 or more vehicles." Allen said members of his club are now rebuilding about five trucks. 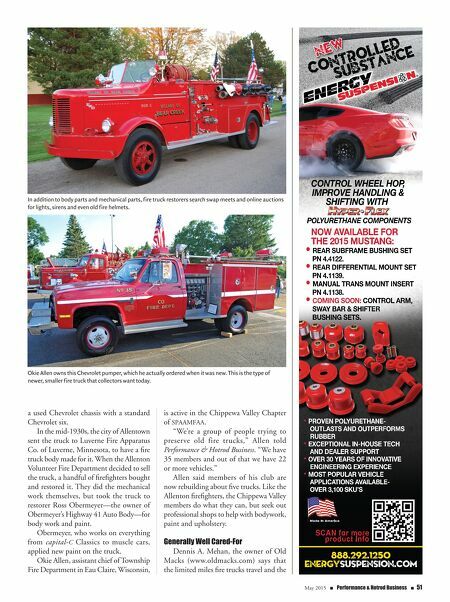 Like the Allenton firefighters, the Chippewa Valley members do what they can, but seek out professional shops to help with bodywork, paint and upholstery. Generally Well Cared-For Dennis A. Mehan, the owner of Old Macks (www.oldmacks.com) says that the limited miles fire trucks travel and the In addition to body parts and mechanical parts, fire truck restorers search swap meets and online auctions for lights, sirens and even old fire helmets. Okie Allen owns this Chevrolet pumper, which he actually ordered when it was new. This is the type of newer, smaller fire truck that collectors want today.